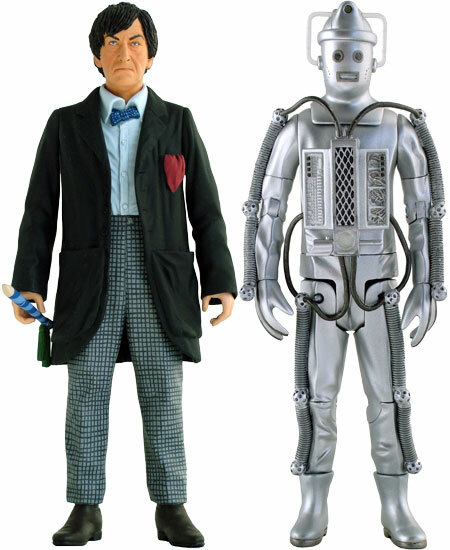 New action figures for the Doctor Who Classic line have been announced! These figures are awesome, but sadly they are only going to be available in the United States as a San Diego Comic Con exclusive. There will be some available for purchase online around the same time, but I expect they will sell out immediately. Hopefully they’ll release some version of the characters through the normal Doctor Who Classics line that is more widely available. You can read further information at Outpost Gallifrey. And if you live in the U.K., you can preorder these figures now from Forbidden Planet International. My thanks to the Voice of the Red Skull for giving me a heads-up about these figures. 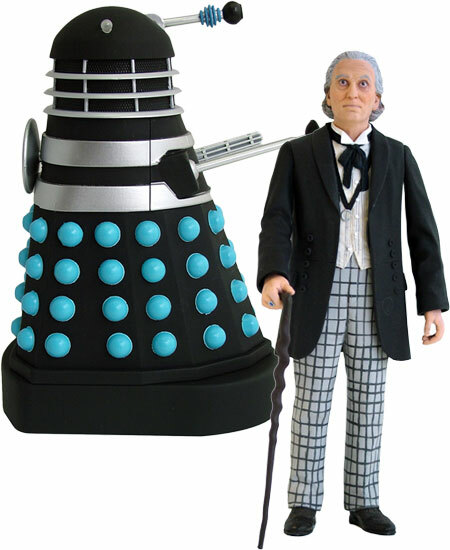 This is the first appearance of the first Doctor, William Hartnell as part of Character Options classic figure series. It was Hartnell who brought the Doctor to our screens in that very first broadcast on 23rd November 1963. At the time the show was shown in black and white and this very limited ‘variant edition’ of the figures stick to a black and white color scheme. The Dalek is from the ‘’Dalek Invasion of Earth’ (Dec 1964) storyline and varies most conspicuously from later versions by the double neck banding and the energy dish collecting aerial on their rear. The Black Dalek was designated by rank as the ‘Supreme Controller’. The color used on these figures are authenticated by the many existing ‘behind the scene’ shots. This is the first appearance of the second Doctor, Patrick Troughton as part of Character Options classic figure series. Troughton was the first actor to experience the Doctor’s regeneration in the Cybermen storyline ‘The Tenth Planet’ first broadcast on 29th October 1966. . At the time the show was shown in black and white and this very limited ‘variant edition’ of the figures stick to a black and white color scheme. The Cyberman is the version which appears, discovered in the cyber-tombs of the planet Telos, in the episode ‘The Tomb of the Cybermen’ (Sept 1967). This alternative costume was most visibly used in the BBC webcast ‘Real Time’ (having previously appeared on a few book and audio book covers). It varies vastly from the gaudy coat of many colors normally worn by Colin Baker’s sixth Doctor whilst retaining some design elements including the dandy’s tie and question mark shirt collar. For many fans this has become almost the preferred costume with it’s more muted, less frivolous, colourways. These figures are SO cool! 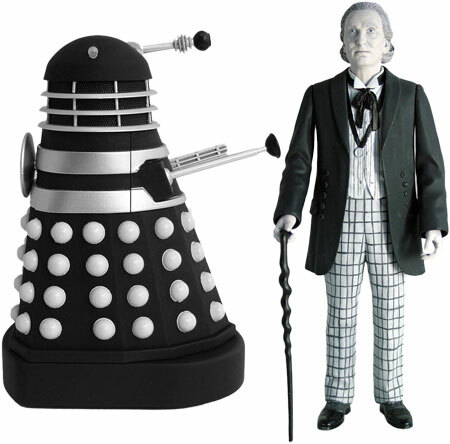 I really hope some variant of them becomes available through the normal “Doctor Who Classics” line of figures. I must have a Troughton figure!!! Already got my orders in for the “colour” incarnations of Doctors one and two (don’t tell the wife). I really like the black and white ones, but then they wouldn’t go with my other Doctors in my display. Just need a Pertwee now. How long until there’s a Matt Smith action figure? If any of you want these sending from the UK, drop me a line! 15 minutes of fame for Voice of the Red Skull! I’ll take the B+W 1st Doctor. The ‘colour’ 1st Doctor looks a bit off… like he hasn’t had enough sleep and is forcing his eyes to stay open but there’s bags under his eyes. Also, his hair is a putty grey. What, he can’t have white hair? I’m sure his hair was white before. An encounter with the Red Skull will turn his hair white! The Red Skull asks: “What’s up with B+W 2nd Doctor?” He’s not black and white! Looks like some blueish-grey in his colour! Photoshop that photo to render it greyscale – it looks much better! The Red Skull votes ‘Yae’ on true B+W, ‘Nae’ on faux B+W! Hopefully it’s an aberration of digital photography that’s shifting the colors incorrectly. PC’s render colours slightly differently than Mac’s. The colour 2nd Doctor looks like a decent colour job. And the colour Cyberman shines like the moonlit sky! Forbidden Planet also advertises Watchmen figures! Irredeemable Shag, the Irradiated Red Skull proposes a combined order to save on shipping! 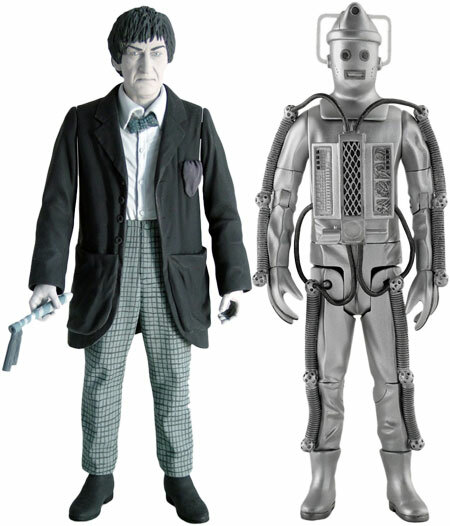 Did you notice the Second Doctor has different head in B&W than in color? Weird. Those are so sweet! Did you read “Doctor Who: The Forgotten”, which featured classic moments from the history of the many different Doctors? Groovy – Doctor Who: Forgotten from IDW has been great! I’ve got them all, but have only read up through issue #4. I loved how the first and second Doctor stories were in black & white. This is probably the best series from IDW yet on Doctor Who. Great read! I like it a *LO&T* more than the crappy technicolour-vomit of the original.